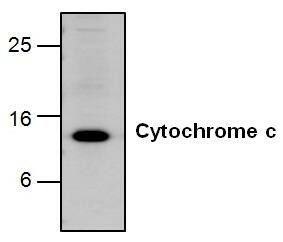 Cytochrome c Antibody (Clone 7H8.2C12) | 3026 | BioVision, Inc.
Western blot analysis (0.5-4 µg/ml). However, the optimal conditions should be determined individually. The antibody detects a 12.0 kDa protein corresponding to the apparent molecular weight of cytochrome c.
Liang, N. et. al. Steroidogenic Factor-1 Is Requipurple for TGF-β3-Mediated 17β-Estradiol Synthesis in Mouse Ovarian Granulosa Cells. Endocrinology, Aug 2011; 152: 3213 - 3225. Chen J. et al. (2007) Stem Cells 10.1634/stemcells.2007-0098. Jones GJ et al. (2007) J. Neurosci. 27:3703-37121. 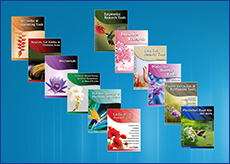 Machiya J-I et al. (2007) Am. J. Respir. Cell Mol. Biol. 36: 428-426. Turpin, S.M. et al. (2006) Am. J. Physiol Endorinol. Metab. 291: E1341 - E1350.